This dissertation addresses the question of the mapping from syntactic structures to morphological cases. The central question regards the relationship between cases and adpositions in those contexts in which they overlap, and how recognition of this relationship can be integrated into a consistent treatment of cases. The analysis is couched in terms of the Principles and Parameters framework (Chomsky 1981, Chomsky 1986, Chomsky 1995), with the mapping between morphology and syntax working along the lines of Distributed Morphology (Halle and Marantz 1993). The working hypothesis is that at least some cases and adpositions are syntactically identical, differing at the post­syntactic morphological level. The main observation is that several syntactic subdivisions can be made, both amongst cases (variations in the form of the noun), and amongst adpositions (separate words adjacent to the noun), relating them to the categories P, D and . (a projection for number and person features). At the same time some cases and some adpositions perform the same functions: the same set of divisions can be made amongst cases as amongst adpositions. From a syntactic perspective, case is an epiphenomenon, relating to several separate nominal categories. In the morphology, case becomes identifiable as differing from adpositions in many languages, cases forming part of another word and adpositions standing as separate words, as idenitified on language­specific diagnostics for wordhood. Nothing in the Principles and Parameters approach to Case predicts the overlap between case and adpositions or the range and variability of cases. The existing possible solutions for such overlap have not been integrated into the standard approach to case. This dissertation seeks to fill this gap, proposing an integrated approach. 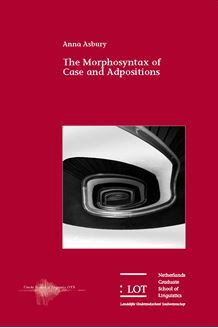 The overlap of cases and adpositions is explained by their spelling out the same range of categories in syntax, forming part of the extended projection of the noun, the difference being derived at the morphological level. The analyses presented focus largely on Hungarian and Finnish for detailed argumentation and exemplification of the mapping from syntax to morphology that results in paradigms of syntactically non­equivalent objects. The dissertation is of relevance to scholars working on the noun phrase or the adposition phrase and their extended projections, and particularly those with an interest in case from a syntactic or morphological perspective.